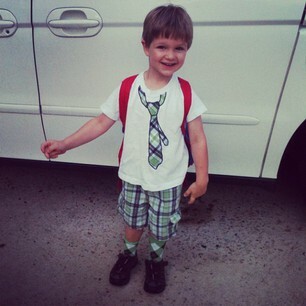 Jude’s first day of preschool was yesterday and he absolutely loved it. I wasn’t sure if I would get teary or emotional, I didn’t. I think I was too excited for him to really think about the fact that he is growing up and becoming more independent. Also, the fact that he is such an outgoing child makes it easier, I think if he was sad and didn’t want to go I would feel the need to protect him. While he was at school I got to spend a little one-on-one time playing with Noah and I think he loved it. He kept crawling up in my lap to give me hugs and kisses. *Swoon I also enjoyed a nice shower and got some work done while Noah took his morning nap. It’s amazing how clearly my brain can think when I have a few moments of quiet. Noah and I picked up Jude from preschool and he got a great report from his teacher. I’m really looking forward to this school year and watching Jude learn and grow. I think preschool is going to be good for everyone, especially after baby 3 makes is grand entrance in a few short weeks!